The smallest HTML editor you'll ever love! Some time ago, I was teaching HTML to a group of high school students and had a hard time finding a decent HTML editor for them. I wanted something better than Notepad, but not WYSIWYG (as my students would learn nothing from that!) I couldn't find anything in my price range (free) so I developed it myself. Download it now and you get the full program including source code! No spyware, no viruses, no gimmicks. When you download the program, Internet Explorer may prompt you with a "Security Warning" with Run, Save, and Cancel options. 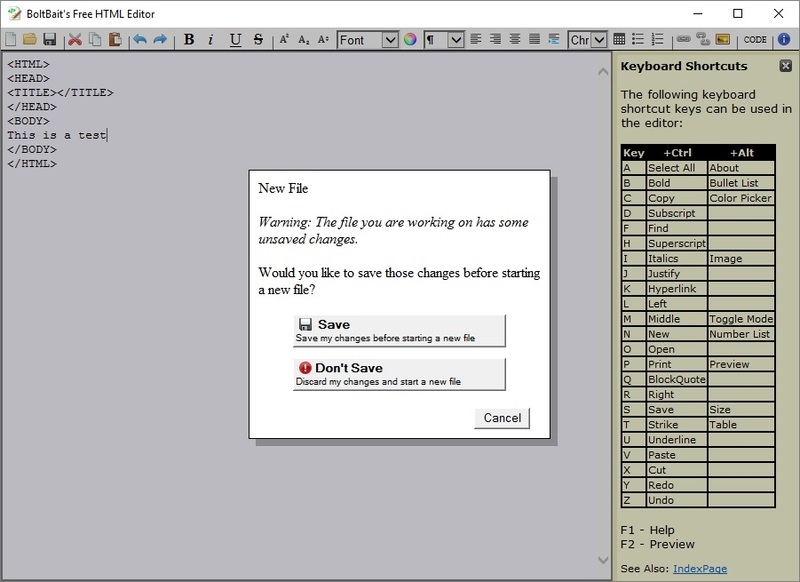 Click the Save button to save a copy of this program to your computer. Then, when you want to create edit a web page, simply double-click on this program's icon. Have a question or comment? Just want to say thanks? How about chatting with other people who just love this free HTML editor? Visit the forums and meet new friends! BoltBait's FREE HTML Editor version 1.5 is now available for download. File size: 150KB. Windows version released March 31, 2016. This is full-featured, with source included.